Mark Davis acquired a small restoration company called Rocky Mountain Catastrophe in Denver in 1996. He was just 27 and didn't know anything about the restoration industry. But it turned out he had a knack for making businesses successful. He and his partner took a company with $3.5 million in annual revenue and tripled it to $11 million in their first year. Things skyrocketed from there. "We did $25 million the second year, $35 million the third year, and started a restoration company called Recovery Solutions International specializing primarily in commercial large-loss recovery solutions," he recalls. Of course, that was just the beginning. Davis went on to sell a majority interest in the company and co-found Belfor USA Group, serving as CEO and eventually growing the company from $35 million to $400 million in annual revenue. He then sold his shares and left Belfor to become CEO of InStar Services Group. His next move was to buy Signal Restoration with partner Frank Torre in 2012. Then, in late 2015, he and Torre bought PuroClean, where Davis is now CEO and chair. Franchising held a powerful attraction for Davis. "I was always envious of the franchise model of distribution because franchised restoration companies always had better distribution than we did at Belfor. It was difficult to compete against that distribution--and they were able to do it with a lot less capital invested because they weren't actually funding those acquisitions, they were selling franchises. It was always my dream to own a franchise system and be a franchisor in our industry." Now that dream has come true and Davis has big plans for PuroClean. His goal is to double the number of franchise locations over the next few years. The brand, with more than 230 franchise locations in 34 states and five Canadian provinces, added 24 new franchises in 2016 and is aiming for 60 new operators this year. He plans to grow the company's international footprint to become a worldwide player in the disaster recovery business, and expand services to better meet the needs of large insurance, commercial, and institutional customers. "We're aggressively expanding and investing significantly in technology, training, and national account development for our franchisees and their employees. This foundation will set up our franchise partners for success for years to come," he says. To provide the vision and strategy for PuroClean, helping guide and lead the company and our franchisees as we build the company into a world-class brand. With my leadership style, I can't make things happen from sitting in an office. I'm on the road a majority of the time, meeting with franchisees every week. Over the past 18 months I've met with 220 of our 230 franchise owners throughout the United States and Canada. I've also become very involved in our exciting franchise growth initiative in which, along with other executives, we travel to underdeveloped or undeveloped markets we have targeted for franchise growth. Through this initiative, instead of being reactive to franchise leads, we proactively go into markets with open territories and have events where we present the franchise opportunity to prospective franchisees. We use a multi-channel marketing approach to drive interest in the events. We include the existing local franchisees in these events for validation and give them an opportunity to get to know their potential colleagues. This process is helping build a culture of franchisees who embrace the growth of the system. While I'm admittedly a student of franchising, I've been in the property restoration industry for more than two decades. I make it a priority to make myself accessible to franchisees. They all have my cell number and can reach out to me with questions about everything from locking in an account to billing for a large commercial loss and collecting on a delinquent account. I believe strongly in servant leadership. When working with my team, I ask them: "What do you need that I'll be able to help you with so that your team can succeed?" I instill confidence in the people I'm leading. I hire the best leaders and managers I can find, and then I serve them. Many people and experiences have contributed to the way I approach leadership. One person who had a great influence was Jack Welch, former chairman and CEO of General Electric, who later authored several business books. He believed in recruiting the best talent and empowering them to lead their teams, set their own goals, while at the same time holding them accountable. I was inspired by his ability to achieve results across such a huge, multinational company with multiple divisions, and the culture that was driven from the top down to the entire organization. Adjusting to the process and time it takes to enact change within a franchise organization. I've served as CEO for various privately owned companies over the past 20 years. In those roles, I've made decisions to make changes and had the ability to make change immediately. As a franchisor, you can't just make a decision and mandate it across the board. It requires consensus and education to earn the critical buy-in of the franchisees. I'm learning to appreciate this process. We listen closely to our franchise owners. What's important to them has a significant impact on how we make key strategic decisions. Our president, Steve White, has done a great job of building a strong culture. Before Frank Torre and I bought the company, Steve had already set a solid foundation focused on serving our franchise owners. He went out and met most of the owners face to face to learn their challenges. In doing so, he built trust in the company leadership. I focus on reinforcing the great work Steve has done and raising the bar for relentless customer service from our support team (HQ) to our franchise owners. If a franchisee needs support, we can and are willing to get someone to their location in a matter of hours. We exist to serve our franchise owners! I always wanted to get my MBA and thought I would go back to school. One of my mentors, Ken Maddox, taught me something when I was in my early 20s that I apply in my own life and career to this day and teach to anyone who will listen. He told me three factors should influence decisions surrounding your professional future: learning, earning, and giving. Early in your career, most of your decisions should be based on learning. The priority is to fill your toolbox with tools. While earning will always be a concern, you should ask yourself, "Where am I going to learn the most?" Where can I gain the tools for my toolbox that will be beneficial later in my career?" You will likely have to sacrifice the earning early on in favor of the learning. If you invested the lion's share of the first part of your career in learning, you'll have a significant amount of earning potential in your toolbox by the time you reach your 40s. Your career decisions in the next two decades can then be shifted to focus on earning, then learning and giving. Then, once you're near retirement, your career priorities should shift toward giving, learning, and earning, in that order. Without this advice, I wouldn't have had the confidence to be on the path I'm on now. My second job after college, I took a $40,000 salary in Nebraska instead of an $80,000 salary in New York City. Why? I believed I would learn more working in a smaller, privately held company for a self-made entrepreneur than for a Fortune 500 company. The level of learning was beyond measure. It inspired me to have the confidence to purchase my own company (Rocky Mountain Catastrophe) at 27. This company became the platform for Belfor USA, where as CEO I drove revenues from $35 million to $400 million in just eight years, making it the market leader in North America. I wouldn't be where I am now had I taken the higher-paying job in New York! I have a 50/50 partner, so I don't make any decision without involving him and vice versa. I believe in collecting as much information from the stakeholders as possible. You have to listen and keep your finger on the pulse of what's important to the team. People respect strong leadership; they lose respect when they think their leader isn't in tune with their opinions. Respected. I'm not about winning a popularity contest. I'm focused on doing the right thing, but at a tempo much faster than most people are accustomed to. The key to power is not using it. Titles don't matter. In an organization, people know who has the personal power. You should focus on building a team of people who know you'll take a bullet for them. Only then will they reciprocate. At that point, it doesn't matter what your title is because you'll have personal power. You have to trust your team and your people. You have to give them a long leash and the true ability to run with it. When you do so, you let them spread their wings and accomplish at a higher level than maybe they would have in a more restricted environment. I set high expectations. I like to use this analogy: If you've ever been to a dog track, you'll notice that to get the greyhounds to run fast there's always a rabbit running ahead of them at a faster pace. In my work ethic, I lead without asking anyone on my team to do anything that I'm not already setting the pace for, at a higher level. Then, it's a matter of envisioning that I'm serving them. They know that they can call me and I'll be able to help them. You have to let them run--and be available to help them when needed. It's composed of experienced, talented winners who respond well to servant leadership and don't need or want to be micro-managed. Our president, Steve White, runs the day-to-day operations. There's a clear distinction between our roles. Frank Torre and I develop the strategy. Steve runs the executive team that executes the plan to realize the strategy. Extreme Ownership by Jocko Willink and Leif Babin and Start With Why by Simon Sinek. That's easy. The most fulfilling aspect of my job is feeling and experiencing the appreciation from our franchise owners when we've done something that's helped them. It's the text messages, the handwritten notes, the passion, and even the tears they show when they're achieving business success partially because of our training, marketing, or business development. It's the most incredible feeling to know you've helped these wonderful people realize their dreams. I can't believe I didn't know until now how wonderful it is to be part of a franchise system. Consumer spending, interest rates, and unemployment have zero impact on our business. Property damage happens. Human error happens. Mother Nature happens. Property restoration is a "have to" business that is paid for by a third-party insurance company. Therefore the restoration industry as a whole is a recession-hardy sector. The trend in our industry is to receive work from a third-party administrator or carrier-direct, with the customer asking for a one-stop shop. Insurance companies want their restoration partners to offer all the services related to a loss. Statistics show when contractors have all the services for a job in-house, customer satisfaction increases substantially. The converse is true when insurance customers must use various vendors to resolve their loss. 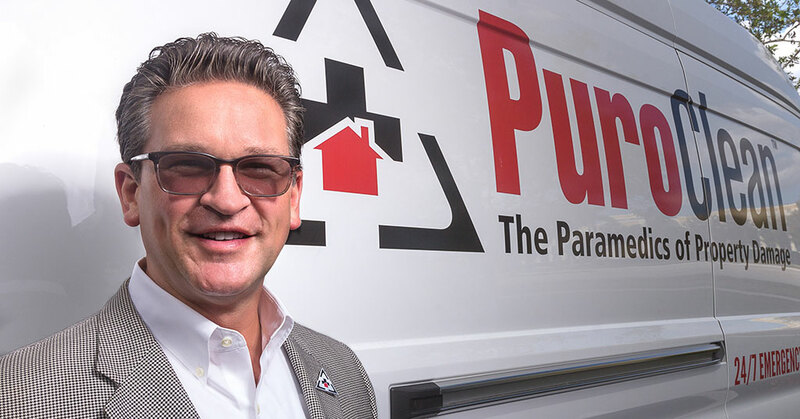 We are ready to meet the demands of the insurance industry because PuroClean is evolving into a full-service restoration company providing a full, turnkey solution. Are your franchisees bullish or bearish about growth and adding additional units? Our franchisees know that as we expand the brand's footprint, establish ourselves as a world-class brand, and provide relentless customer service, the more national work we will attract. PuroClean is truly a family--our franchise owners support each other on a daily basis. Because I'm on the road 70 percent of the time, I don't start my workday at my desk. Regardless of where I am, my workday starts around 6 a.m. I check email from the night before, review follow-up tasks, and review what's planned for the day and the remainder of the week. I don't believe you can be a strong leader sitting behind a desk. I'm always running around involved with our support team members and franchise owners. Keeping up my tempo and being the "rabbit at the dog track," I'm racking up as many as 15,000 steps a day. I do weight training each week and mostly get my cardio from being constantly on the move. I've had different philosophies on this over the years. I think it's important to have strong relationships with your inner circle, to like your management team, but that doesn't mean it needs to go deep into your social life. It's important to know and care about your team members' personal lives, their families, and their priorities. But it's also healthy to keep a distance so they're not completely merged with each other. I'm an all-Apple guy. I have my MacBook Pro, iPhone 7 Plus, and a backup iPhone with me at all times. In an emergency response business, one phone call might be worth a $10 million contract, so you need to be able to respond. I can't afford to be down for a day. I'm not someone who desires to relax, though one thing I love to do is to cook for others. I know it sounds strange, but I like to hand-wash the dishes after the meal. I find it therapeutic. It's my form of relaxing. The same goes for laundry. I don't let anyone ever wash or fold my clothes because no one can do it the same as I do. It would be the exact opposite of relaxing because I would be anxious. Cabo San Lucas and Italy. PuroClean is a global brand that will have more than 500 locations by 2021. Our vision is to be the premium restoration company. It's not to be bigger than our competitors, but rather to be known as the premium brand for relentless customer service. We have nearly 240 franchisees in operation today with an aggressive franchise development strategy to reach 500 locations. We have already become a premium provider for customer service and have just landed national accounts with the number two and number three insurance companies (by policy count) as preferred service providers. Every day they provide us with customer service scores regarding our franchisees' performance. We know which owners are performing well and which need to improve. We're committed to our customers. If we have franchisees with lower scores, we red flag them. We will not let a non-performing franchise owner affect the brand. To build a world-class brand, consistency is key. You achieve consistency through high standards, training, customer service, and monitoring. Then we make sure that our franchisees who are working at the highest level are the ones on our national accounts. The economy really doesn't affect the restoration industry because property damage doesn't care if the economy is up or down. Property damage occurs at all times. Many might expect me to say that Belfor USA was my greatest accomplishment. We worked hard, achieved big numbers, and learned a tremendous amount, but we had the financial support of the largest private company in Germany behind us. My greatest accomplishment is what my business partner Frank Torre, Jr. and I have been able to achieve in the past five years. We bought Signal Restoration in 2012 and PuroClean in 2015. I'm proud of what we've been able to achieve without the backing of a major financial partner.